How to make SVGs inline? Here is a very basic example how SVG injection works with our open source SVGInject library. The injection replaces the `<img>` elements with the SVG markup loaded from the files specified by the `src` attribute. You can find more information about SVG injection on the SVGInject GitHub page. Easy to use, no special server side technology required. SVGs are kept in separate files, thus keeping the HTML code clean. SVGs can be dynamically inserted into a webpage. SVG images may be displayed with a slight delay, because they are initially not part of the HTML code. In short: If you are not sure which method to choose, try this one first. It is very easy to implement and keeps you source code clean. If your websites are generated on the server with PHP, Rails, Django or similar server side technologies, inserting the SVG code into the HTML on the server side is one possible option. For this the server side pages usually contain an instruction that makes the server replace the instruction with the contents of an SVG file. The HTML file then contains the SVG markup already when it is delivered by the server. SVG images are displayed immediately, because they are already part of the HTML code when the page loads. In short: If you are already using a server side technology like PHP, Rails or Django, you should consider inlining the SVGs on the server. With this method you write the SVG code directly into the HTML code. This is usually done by copying and pasting the code from the SVG file into the HTML code using an editor. Using this method has the advantage, that the svg is immediately available when the HTML is loaded. No additional HTTP request is necessary since the SVG is already included in the HTML. We do not recommend this method, although it may be the most straightforward way for making SVGs inline. The HTML source code will become bloated and unreadable. 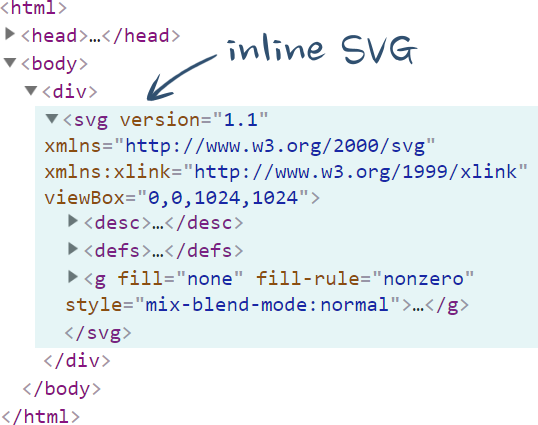 SVG code is usually not very readable and an SVG file can easily have hundres of lines of code. Changes in the SVG file will require copying the code into the HTML file again. And if the SVG file is used in different places of the HTML code, it has to be copied again to each place it is used. In short: Use this method only for small experiments, not for real projects.